This post is dedicated to all of my friends who travel across Canada and want to get a taste of my hometown. 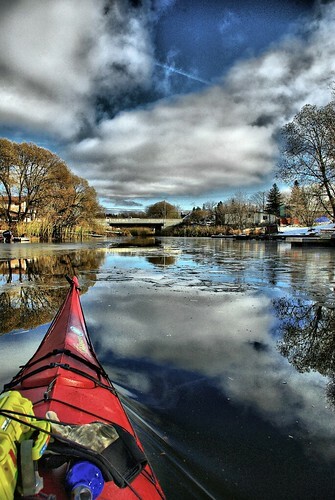 This is a completely biased list of things to do in Kenora! This is what I would do, if I were there with you. In no particular order! 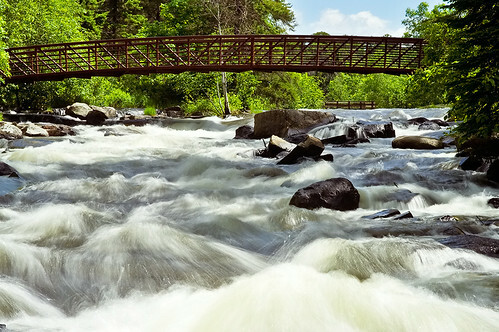 Go to Rushing River Provincial Park (1/2 an hour southeast of KTown) and play in the falls. There’s a little gully near the bottom that acts like a whirlpool when the water level is right! When its wrong, you go tumbling over the edge and get all scratched up. Fun stuff! Bring some BBQ and use one of the grills and have some lunch, or you can even camp here! Also, about three minutes down the road there is a pretty sweet (read: ghetto-licious) miniature golf course. Check it out! 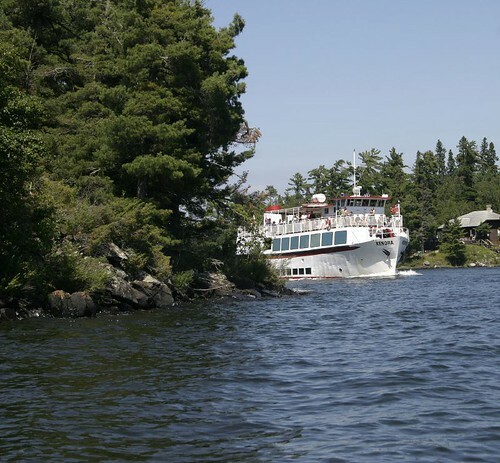 Take a spin on the MS Kenora! I recommend a dinner cruise which gives you a nice sunset view of everything. Tour the stars homes, see an eagle’s nest and possibly an eagle (we are pretty sure its stuffed) The food is kind of overpriced and somewhat hit and miss, so if you are on a budget, skip the dinner and head straight to Hap’s when you get off the boat! (See #4) You will get the best seat on the patio because you will be there earliest. Very important. Haps Patio is a must-do Kenora experience. It doesn’t have much of a view, but the locals can be pretty entertaining. Get a seat and grab a Little Amik (A frosty mug of beer with a shot of gin and some bar lime) and some chicken fingers (with the best dill sauce ever!) Make sure you aren’t driving home. Mom’s house is within walking distance! Watch out for bears. So now you need some morning after breakfast… there are a few choices, but the old standby is the restaurant across from the Tim Horton’s on Hwy 17 W. I think its called Pattie’s now. Get the perogies on the side! While you’re in the neighbourhood, you can take Mikana way to Anicinabe Park and go for a quick swim! There’s also a nice golf course nearby, if you are into that. Tour the Lake of the Woods Museum! It has lots of info about the history of Kenora, the aboriginals, the lake, the mining and fishing industries and its cheap. Its little, but there’s a lot to read, and partway through the summer they have an amazing quilting exhibition. Its cooler than it sounds!! Its also a nice thing to do if its raining. Just behind the museum is the Wharf Marina, where you can get an ice cream and sit on the dock! Yes, we do a lot of sitting on docks. You can also see the Grace Anne II, if she is in. 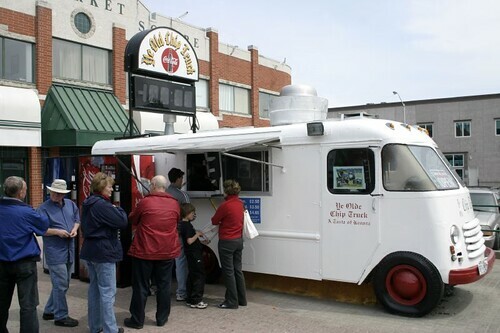 Now to spread out a bit – go to Keewatin! OK, Norman. There is a nice trail, the trailhead is just on the side of the road (Hwy 17 between the Super 8 and the Bridge before the Husky). You can see the dam and lots of water rocks and trees! Its about a 1 hour hike, depending how fast you are and which sections you do. This is a map of what it will be like in the future – the trail part is right! Maybe you can find a better map in town, or just ask someone. Still haven’t had enough nature? Rent a Kayak! You can paddle around the lake and see the sights from up close, or take Laurenson’s Creek – watch out for the jail at the end! Rent kayaks at The Hardwear Company on Main Street. You can paddle to Coney beach and go for a swim. Its also a good place for some frisbee golf! Or, if you are tired from all the awesomeness, take a boat taxi from the Wharf Marina. You’ve worked hard. Time for dinner! Wait, one more thing. 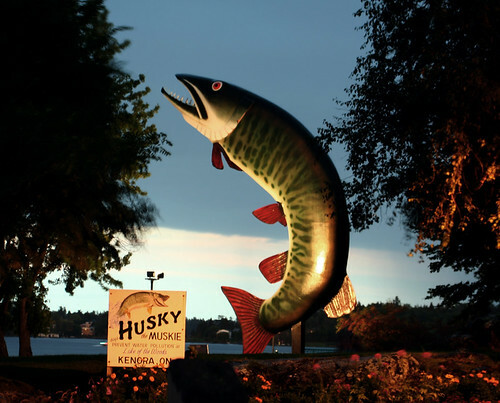 You have to walk over to the Huskie the Muskie and take your picture under it. Something to show the grandchildren. NOW! Go to the Plaza for dinner. It is my favourite restaurant on this earth. Try the Kalamari Appy, the Chicken Souvlaki and DEFINITELY the Avgolemono Soup. And that is basically everything I try to cram into a Kenora visit. That and a giant family to visit. I see now that its a lot of eating. What can I say, they have good food in Kenora! Good luck, and send pictures!